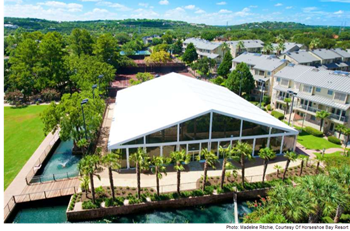 ​​​​​ HORSESHOE BAY, BURNET COUNTY – The Horseshoe Bay Resort, located off of Lake LBJ, has completed the first phase of a $60 million renovation. The first part of the changes includes a top to bottom remodeling of the resort's 100 Palm Villas one-, two- and three-bedroom units. The 7,000-acre resort also got a new pavilion, an upgraded entryway, a remodeled party boat, a remodeled fitness center, refreshed golf facilities, and the new 360 Sports Club. Upcoming renovations include a few hundred more rooms, 25,000 sf of meeting space, a golf clubhouse and course, a remodel of the resort's onsite jet center and the opening of the Waterfront Bar and Grill.